On June 20, 2011, Big Brothers Big Sisters of Northwest Arkansas was presented with a $20,000 check from the Talent Development department at Walmart. 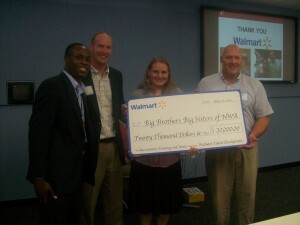 This was through a Local Choice grant from Walmart in support of Big Brothers Big Sisters mentoring programs for children with incarcerated parents. Pictured Left to Right are: Chris Clark from Walmart; Big Brothers Big Sisters Board Member Asa Hutchinson III; Big Brothers Big Sisters Executive Director Erin Rongers; and Big Brothers Big Sisters Board President Doug Allen. Want to be a part of something big? Contact Big Brothers Big Sisters of Northwest Arkansas at 479-756-5683 or visit www.bbbsnwa.org for additional information. Learn how you can help change how children grow up in Northwest Arkansas by going to bbbsnwa.org.